Victory casts a veil on truth, and crushes critical thinking with an anvil. It’s as true in politics as it is in sports. You win in American football, and all the persistent clouds over execution are overlooked by the shiny object of the victory. In politics, too, the clouds over unexecutable policy statements and personal failings are burned away by the cognitive dissonance that emanates from the glow of election night acceptance speeches. The voters have spoken. The fans screamed their support. We won. Go team. To some, for whom ambition applies more to policy than personality, the votes are a starter’s pistol, a referee’s whistle, a signal that the clock has started and it’s time to get busy. But to others, the win is a rush of serotonin – engaging, enraging, empowering – a call for blind loyalty that builds a brick-brained wall of silence against detractors, even when they’re right. The Republican victories of 2010, as those of the Democrats in 2006 and 2008, were spun by the winners as an unquestionable mandate, an embrace of their agenda, as opposed to what the results of those elections really were – a repudiation of the actions – and inaction – of the sitting Congress. These are politicians “who have refused to listen to the voices of reason and compromise that are coming from outside of Washington,” as President Obama said, last week, referring to Republicans on the Super Committee, a construct that itself was a nod to stubborn stupidity, and that truly, and sadly, represented nothing good about our republic – only the constipation of compromise, the lowest common denominator of what passes for political discussion in the District of Columbia. It is only within the beltway bubble, that the GOP can rail against higher taxes for millionaires because, as Speaker Boehner’s office claims, it would be a “job-killing tax hike on small businesses,” while also railing against the president’s plan for tax breaks for small businesses to spur hiring. There’s no disconnect, for them (or their followers), because they’re the ones saying it. Similarly, when the president announced, last month, that he would withdraw all troops from Iraq by the end of the year, effectively concluding the war there, the Republicans pounced on his policy as “cut-and-run,” even though the agreement to pull troops out by December, 2011, was negotiated by the Bush “Mission Accomplished” administration. But this cognitive dissonance doesn’t just cut against the GOP. The Democrats are guilty of it, too. Otherwise, the mid-term elections of 2010 would have had a much different result. Much of the dissatisfaction is brought about by a perception of overreaching, whether it’s the Democrats with the Affordable Care Act (which really didn’t reach far enough), or Republican actions, like the recently overturned Ohio collective bargaining law and Mississippi’s controversial Personhood Amendment. Extreme, anti-populist, anti-middle class, legislation like that is “too much, too soon,” as Ohio Gov. John Kasich (R) admitted that night. Politics like that have put us on an increasingly unproductive political course. “Our politics have become so polarized that both parties seem to be getting pushed farther and farther from the center, which means farther and farther from where most voters reside,” Republican pollster, Whit Ayers, told the Los Angeles Times, after the election. It has gotten so bad, that even popular legislative proposals, like the tax hike on millionaires, are re-framed as left wing socialism, solely because they are supported by most of the Democratic caucus and President Obama. “The President can’t get anything done without the support of Congress,” then DNC chair, Tim Kaine, told a group of students in 2010, before the elections. He might have added, that without the agreement of the president, nothing can get done, either. Our Founding Fathers intended the separation of powers to be a check and balance against overreaching by any single branch of government, with the expectation that reason would prevail. Instead, it has become a catch-22, where leaders are available only when they’re not there, and parading in lockstep is a fool’s obsession. 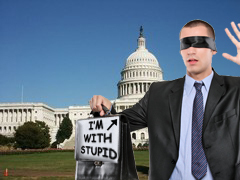 “I’m with stupid” may make a cute T-shirt, but it’s a lousy name tag. Time for the real leaders, in all the policy making branches, to cut the cord. Cldn’t agree more! And ironically enough the Grand Daddy of this fractured process, Newt, is currently the front runner for the GOP nomination!